A down night for ABC. 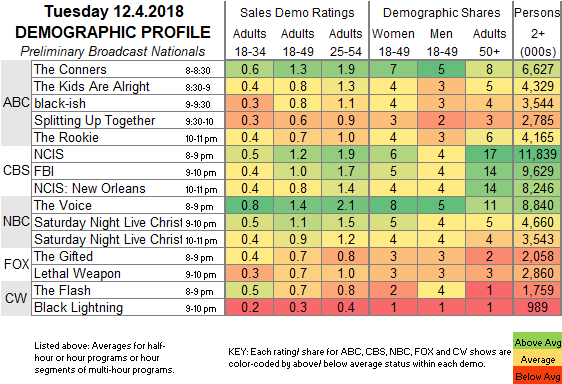 ABC: The entire line-up lost 0.1, putting THE CONNERS at 1.3, THE KIDS ARE ALRIGHT and BLACK-ISH at 0.8/0.8, SPLITTING UP TOGETHER at 0.6, and THE ROOKIE at 0.7. 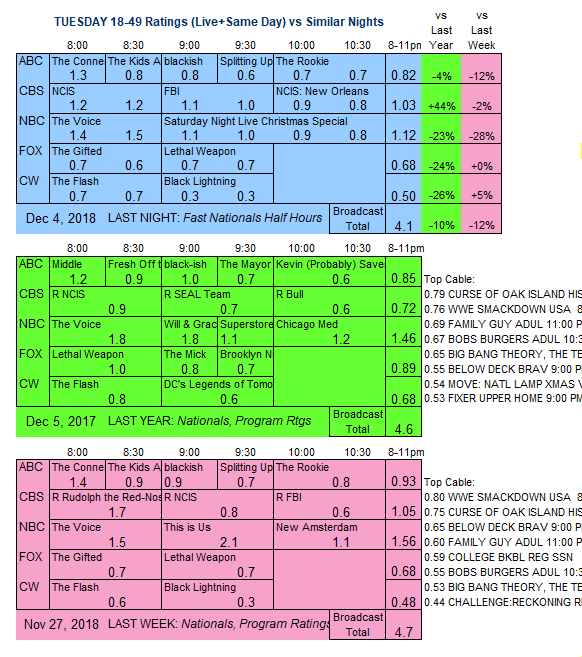 CBS: Returning from a week of reruns, NCIS (1.2), FBI (1.0) and NCIS: NEW ORLEANS (0.8) were all steady. NBC: THE VOICE lost 0.1 to 1.4, and a SATURDAY NIGHT LIVE CHRISTMAS special was at 1.0. FOX: THE GIFTED (0.7) and LETHAL WEAPON (0.7) were both steady. CW: THE FLASH gained 0.1 to 0.7, and BLACK LIGHTNING held at 0.3. Tonight, FOX airs midseason finales of EMPIRE and STAR.